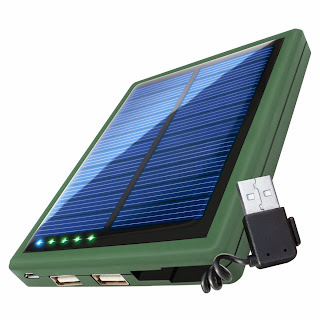 Accessory Genie - Consumer Electronics and Accessories Industry News: Sunlight, USB, Power! Love your electronics? Love the outdoors? Need the connection? Then I have the perfect product for you, the ReVIVE SL 5000mAh! The ReVIVE SL5000mAh is a solar charger power bank equipped with stowaway USB cable and dual USB charging ports. Great for Phones, Tablets, Portable Bluetooth Headsets and more, the SL 5000 keeps your electronic world running while enjoying the great outdoors. The SL 5000 is compact and travel friendly, so you can use it anywhere and easily store it when you’re done charging. Constructed with a tough, rubberized finish, the power bank is made to withstand drops, bumps, and dings while traveling. Take it with you in your backpack, purse, car and much more! Using the SL 5000 is a snap. Simply place it in the sun and it will instantly start charging! When placed in the sun, the LED indicator glows red to show you when the panel is receiving power. No sunlight? No problem! You can also power up the SL 5000 via USB outlet for a quicker charge. The built-in stowaway USB cable allows you to quickly pull charge from a USB outlet without having to grab other cables. And like most products, the SL 5000’s quality is guaranteed and backed with a 3 Year Manufacturer’s Warranty. Never be left without a charge and enhance your overall outdoor experience with the easy to use SL 5000 Charging Station! The ReVIVE SL 5000mAh is set at $39.99 and is a great gift for the holidays!